Located in Paris Observatory, the SYRTE (Time Space Reference System) is a mixed research unit (UMR 8630) of the CNRS, the Paris Oservatory, and the University Pierre & Marie Curie (Paris 6), with the LNE as an administrative supervising partner. The SYRTE is also a department of the Paris Observatory. Combining fundamental / applicative research and scientific services, the SYRTE is now the first in international ranking of multidisciplinary fields: Time/Frequency metrology, atomic interferometry and inertial sensors, celestial reference systems, Earth rotation, science history. The laboratory promotes its research activity towards the socio-economic world and society: patent submission, industrial partnerships, public services missions, training, and knowledge transmission. The SYRTE develops many metrological instruments that take profit from the wavy characteristic of matter: highly stable clocks with cooled atoms among the best in the world, clocks for embedded systems (GALILEO, ISS…), inertial sensors (gyrometers, gravimeters, accelerometers) measuring rotation speeds or accelerations with an extreme precision. The SYRTE also develops remote comparison methods through satellites of optical fiber in order to improve the construction, diffusion and atomic time scales connection. Under the aegis of the LNE, the SYRTE is the National Metrology Laboratory in the Time / Frequency field with the mission to improve and provide SI’s units in this field. In this respect, the SYRTE is in charge of the construction and the availability of the legal French time built from a UTC time scale made thanks to the cool atomic fountains of the laboratory (one of the best realization of the UTC International time scale reference. The SYRTE takes part in international collaborations in order to ensure the international equivalence to the French Metrology for the Mutual Recognition Arrangement (MRA). It also ensures the traceability of the first level in the standard chain towards users. The SYRTE is strongly involved in several operations of the “Investissements d’Avenir” program and manages the National Excellence Laboratory FIRST-TF on Time/Frequency metrology and its applications. It also copilots the laser physics laboratory of the metrology fiber network REFIMEVE+. 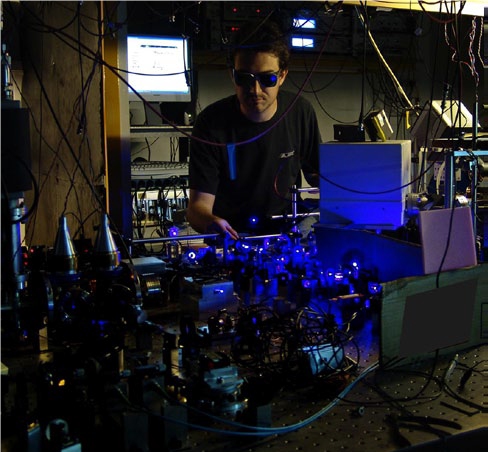 Optical clock: Strontium atoms are trapped and laser-cooled. - R&D activities: characterization and improvement in the precision of techniques and time transfer protocols per optical fiber. - Know-how transfer to the industry: cold atoms clock developed by Muquans from a SYRTE concept. - Service activity: realization of the national time reference and providing of this reference to the SCPTime® system.